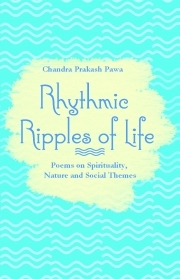 Description of "Rhythmic Ripples Of Life"
This book is a collection of poems on spirituality, nature and social themes. The poems are simple, readable and reflect the contemporary universal thought on these subjects. The rapid pace of modern life is shifting mankind increasingly away from its innate moorings with the nature developed from the earliest days when humans began to walk the surface of our mother planet. The artificial and the virtual are forcing out the life giving experience of living with nature. The poems relate the profound relationship that exists among spirituality, science, nature and environment and bring out that our connection with nature is now under threat. Mankind needs to rethink its collective ways and mend them to relearn living harmoniously with nature. It has been said that life lives on itself. Higher the pace at which we live, more rapidly we consume life giving founts of nature. Chandra Prakash Pawa is a retired Superintending Engineer of UP Rajaya Vidyut Utpadan Nigam Limited Lucknow. He is now working to promote protection and sustenance of the environment. He also works with schools in NOIDA to create awareness about issues and challenges relating to the environment. His other interests are creating herbal gardens, waste management greening and skill development among the youth. Reviews of "Rhythmic Ripples Of Life"
Through this book ,the author has tried to correlate science ,spirituality and nature in a very simplified way. Language used in the poetry is very simple and easy to follow.